SANTA MONICA, CA – Although SEO is a serious time commitment, there are some lighthearted moments. 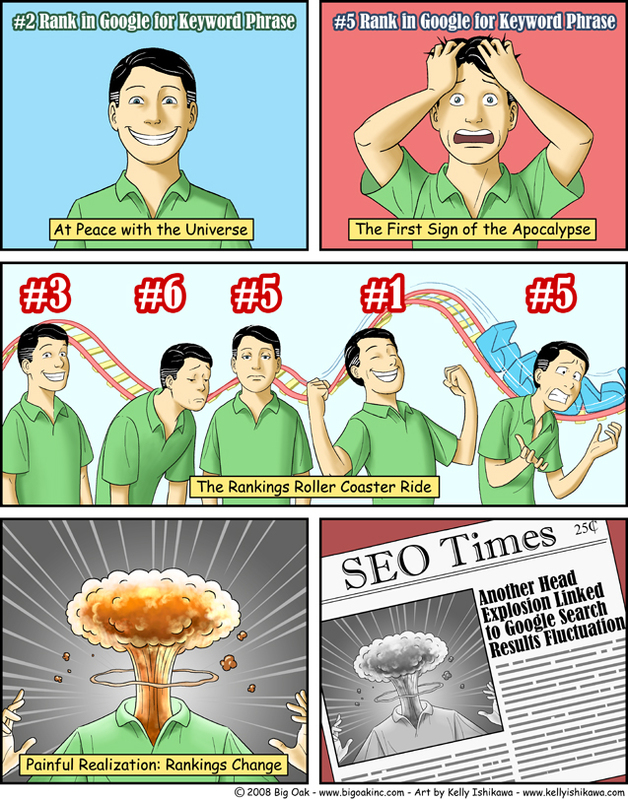 From realizing that rankings can become a roller coaster ride if you check them moment-to-moment, to comedic commentary on just how perhaps overly personal searches have become (as outlined in our recent article, Search, Plus Your World), here are a few funnies to start your weekend off on a happy, lighter note. The Rankings Game: What happens when we get addicted to checking our placement on Google’s search results? 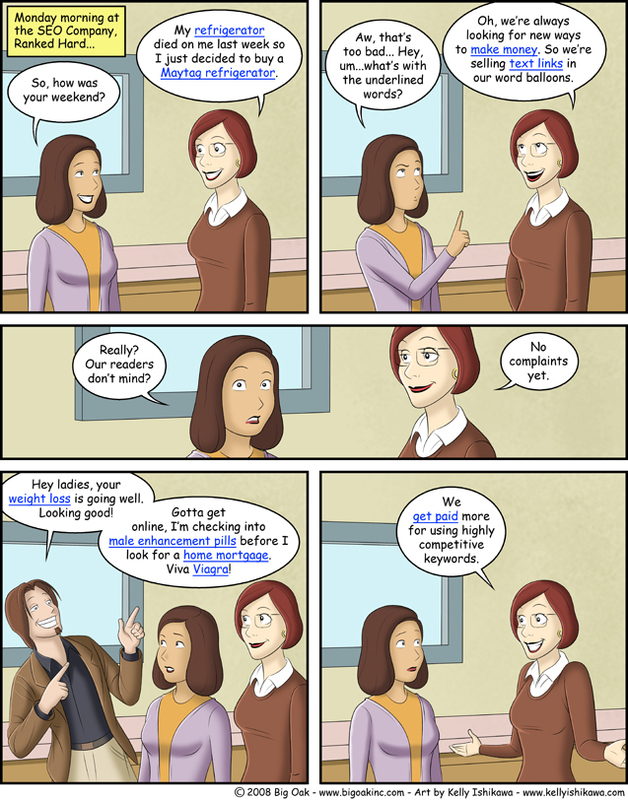 A wonderful comic strip by BigOakInc.com showcases the dangers of checking your rankings too often. So how do you avoid this roller coaster? Our client CariniAir.com is a good example of what having the right attitude about the nature of changing rankings does for peace of mind. Doug Cooper, the VP of Marketing for CariniAir.com, has been working with Millionairium for a relatively short period of time, and was supportive of our efforts, which landed him the top spot in Google Maps and Google Places. Cooper understands that rankings fluctuate slightly, but keeps it positive about the big gains in his website rankings. When The Use of Highly Competitive Keywords Goes Wrong: Again, BigOakInc.com makes a great point about overusing keywords by inserting them into a conversation between coworkers at an SEO company. While funny, this comic strip emphasizes that White Hat SEO techniques are so important for higher rankings, because Black Hat SEO simply defeats the purpose of keywords, because keyword stuffing without anything to back up those keywords is simply bad practice. According to Husayni, Black Hat SEO techniques include any techniques that use spam, cheap links and poor or irrelevant content just to get a higher ranking, and these techniques just hurt you in the long run. As you ruminate over the free SEO advice that you’ve learned about while reading these comic strips, also keep in mind that SEO efforts count for your blog content as well, Husayni advises. Given that 6/9 of the domains that rank for the keworyd SEO do not have the particular KW in the url, I would say it quite possible to rank for the keworyd SEO within a realistic timeframe like 6-8 months(assuming there is a correlation between keworyd in the url and ranking, and that you are able to obtain a local keworyd optimised url). i agree with you ali, my blog is regularly update, it\’s still 1 month old but already got good traffic, because i updated it daily with fresh and unique content.